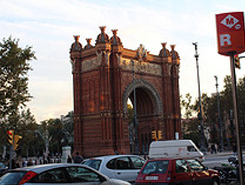 This beautiful arch presides over Passeig de Lluís Companys, a wide promenade leading to the Ciutadella Park. It is located at the top of the promenade, where it meets the Passeig de Sant Joan. 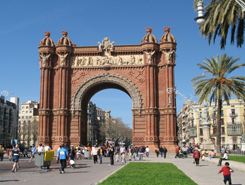 The arch is built in reddish brickwork in the Neo-Mudéjar style. The front frieze contains the stone sculpture Barcelona rep les nacions (Catalan for "Barcelona welcomes the nations") by Josep Reynés. The opposite frieze contains a stone carving entitled Recompensa (Recompense), which represents the granting of awards to the participants in the World Exposition. The friezes along the sides of the arch include allegories of Agriculture and Industry, works by Antoni Vilanova, and of Trade and Art by Torquat Tassó.